Where do I begin? Do I need all these documents? Let’s just say that each document that you can locate, will add very important pieces to your family history puzzle. Is it necessary to get all the birth and death records in order to begin my journey? Oh, no… not at all. You can do a whole lot of things without having the official documents but they can really give some important insights into your family member’s past and help to keep you on the right path. Not necessary, but invaluable. Think of them as collecting little jewels along your journey into your family’s history! For most people, the first three or four generations will all have official birth and death records that can be obtained. There comes a point where there will be no county or state birth/death records available for some states or counties. Then we have to get creative on how we verify important birth and death information. These vital records give us a peek into a happy time and sorrowful time within families. Birth records are the #1 document to have for each person since they are filled in by the people directly involved. The mother is giving her name and the father’s name as well as the child’s name that she has had the intimate pleasure to give birth. While not issued on happy occasions like birth certificates, death certificates can be a wealth of information. Of course the deceased person’s name, date and time of death, and place/cause of death can be a primary source. It is important to remember that when you get to the birth date and name of parents and where they came from, this information becomes a secondary source. Getting a bit technical here, but it’s good to know because some people take the names written down for parents or the birthdate as a fact. What we have to remember is that the person that is giving the information is in a state of shock to some extent over the death of the your shared relative. They also might not be all that familiar with the deceased person’s family – especially if there wasn’t much talk about one’s parents! I say this because it is important to use these particular pieces of information as tentative until you can verify how factual they are. I know, that might seem confusing, but it helps to know up front instead of finding out later. It’s all a part of the expedition we are embarking on: if all the puzzle pieces fit together immediately, then it wouldn’t be nearly as satisfying, right? 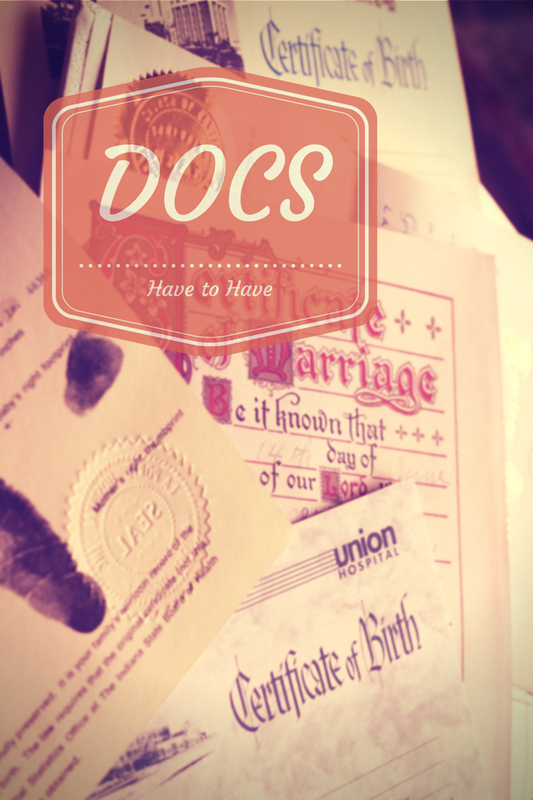 Ask parents and grandparents for copies of their birth certificates. At the same time, you might as well ask for copies of marriage records and death certificates. If they don’t have a copier or scanner, you can take pics with your own camera/smartphone, personal scanner (flip-pal) or simply take everything over to an office supply store or shipping storefront and pay to use their self-serve copiers. If you are at the point that no one in your family has the actual records you are hoping to obtain, then you will want to put some money out initially to get copies from official state/county offices. I always suggest that you search for the county health department where your relative was born. You can walk in to a health department or choose to make a request through the mail which takes longer. If you don’t live close or can’t get there during their office hours, then a mail-in request is a helpful alternative. In Indiana, county health departments began recording births around 1882. Every state is different so a quick online search will clarify what is available for your relatives. Even the dates that state health departments began to record vital records can be different from the county level. For example, in Indiana, the state started recording births in October, 1907 and deaths in January, 1900. It pays to do a little research for each particular state! If requesting via mail, you will need to print out a request form from either the county health department or the State health department directly from their website. Pay attention to their exact requirements so that your request doesn’t get delayed or returned unfilled. You will need a copy of your own driver’s license and a cashier’s check or money order instead of personal checks or cash. ($5 – $15) And last but not least, always include a SASE (self-addressed, stamped envelope) so that your documents gets mailed out sooner than later and with greater ease.